Abstract : In recent years, an active development of novel technologies dealing with medical training, planning and guidance has become an increasingly important area of interest in both research and health-care manufacturing. 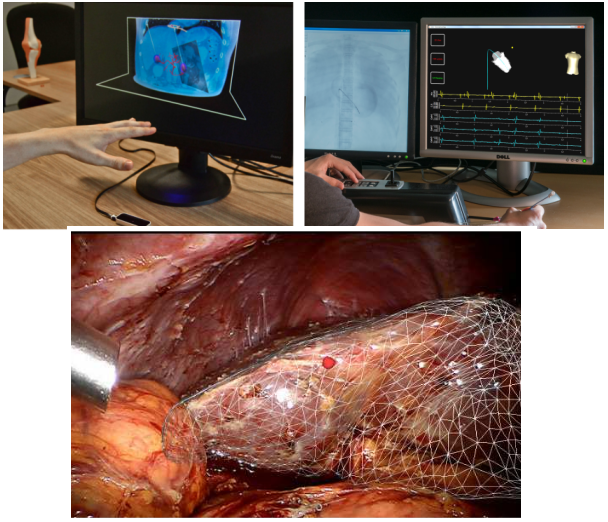 A combination of advanced physical models, realistic human-computer interaction and growing computational power is bringing new solutions in order to help both medical students and experts to achieve a higher degree of accuracy and reliability in surgical interventions. In this paper, we present three different examples of medical physically-based simulations implemented in a common software platform called SOFA. Each example represents a different application: training for cardiac electrophysiology, pre-operative planning of cryosurgery and per-operative guidance for laparoscopy. The goal of this presentation is to evaluate the realism, accuracy and efficiency of the simulations, as well as to demonstrate the potential and flexibility of the SOFA platform.